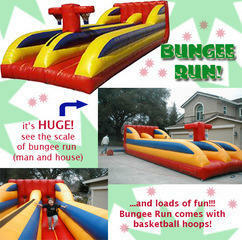 The bungee Run with Basketball Hoops is a game where 2 players are harnessed in to a set of bungee cords. Each player tries to make a mad dash down their individual lane to see who can get there Velcro Baton but the furthest, while stretching the bungee cord to its capacity and then it blasts them back to the start. The game is played when both players are harnessed in, with their batons in hand. The attendant or referee blows the whistle or yells GO! Then the players make a mad dash to see how far they can set their Velcroed Batons on the center Velcro Strip. The Player who gets the furthest wins. The Basketball hoops add a different way to play this game. Instead of Velcro batons each player gets 3 miniature basketballs. The Goal is to get the three balls or as many as possible into the hoops first. Players and spectators both will have great fun and laughs with awesome photo opportunities with the Bungee Run with Basketball Hoops game. Great for all parties and events.